Progress has been made and there is more fun to be had now than there was before, but the original Dead Island‘s “rough-edged gem” status makes it harder to forgive Riptide of committing similar sins. Dead Island: Riptide is at its best when it gives you a horde of zombies and a nail-studded baseball bat – or some other lovingly crafted instrument of close-quarters re-death – to swing in their direction. Techland’s just-released sequel builds directly on the simple first-person brawling pleasures that worked so well in the studio’s 2011 original. 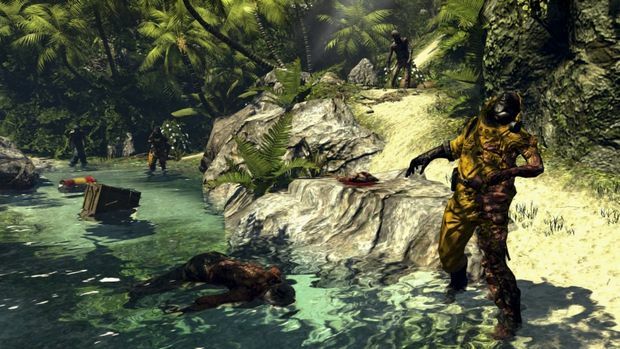 It may boil down on the most basic level to Dead Island 1.5, but Riptide proves that such a designation doesn’t necessarily have to be a bad thing. Our heroes just can’t catch a break. After escaping the zombie plague that swept across the island of Banoi in the first game, they find themselves captured and locked away aboard a military ship shortly after Riptide opens. A corporate weasel by the name of Serpo is running the show, and he intends to conduct research on the four immune people – now five, but we’ll get to that in a moment – in an effort to save humanity. Or so he says. The original game’s foursome meets up with Riptide‘s fifth playable character – a fellow immune – during the opening cutscene. John Morgan brings along a new hand-to-hand combat-focused set of skill trees and a new personality, but there’s no mystery here for Dead Island veterans. The newcomer fits right in alongside our established four in terms of how he plays. It’s not long before Serpo’s plan goes sideways and zombies overwhelm the military ship, one of this story’s many leaps in believability. How exactly would zombies overrun an entire ship filled with armed soldiers who have no doubt been briefed on the undead situation? And why would the immune so vehemently resist the idea of cooperating with researchers who are presumably looking into a cure for this epidemic? The outbreak results in a shipwreck that leaves our immune heroes and a couple of other survivors stranded on the nearby island of Palanoi. It turns out there are zombies here too. Surprise! Riptide‘s multitude of narrative shortfalls all become inconsequential as you fall into the fun rhythm of whacking zombies upside the head with an assortment of weapons and weaponized objects. The absurd plot gets a pass on one level since Dead Island: Riptide is basically just riffing on cinema’s own gratuitously gore-fueled zombie horror stories, much like its predecessor did. There comes a point, however, where the leaps in logic become too great to ignore. Moments when Riptide‘s video game sensibilities get in the way of telling a coherent story. Consider this example: you’ll frequently encounter mini-missions that involve saving a trapped survivor from a horde of zombies. Dedicated explorers will encounter 20+ of these over the course of the game. In every case, the saved survivor chooses to go it alone on this sparsely populated, zombie-infested island. Joining together with the other survivors is never even mentioned as a possibility. There’s always going to be a suspension of disbelief required when you’re talking about something like zombie fiction, but the beats at least need to make narrative sense. We frequently consume stories about space aliens and magic and other things that probably don’t exist, and the ones that we buy into are successful because they recognize the importance of telling a coherent stories within the constraints of the fiction. Dead Island: Riptide loses sight of that frequently, and the experience as a whole suffers for it. Fortunately, Riptide‘s multitude of narrative shortfalls all become inconsequential as you fall into the fun rhythm of whacking zombies upside the head with an assortment of weapons and weaponized objects. The play is largely the same as it was before: first-person perspective brawling with an emphasis on careful timing, stamina maintenance, and weakness exploitation. It’s the flow of the action that sees the biggest change. 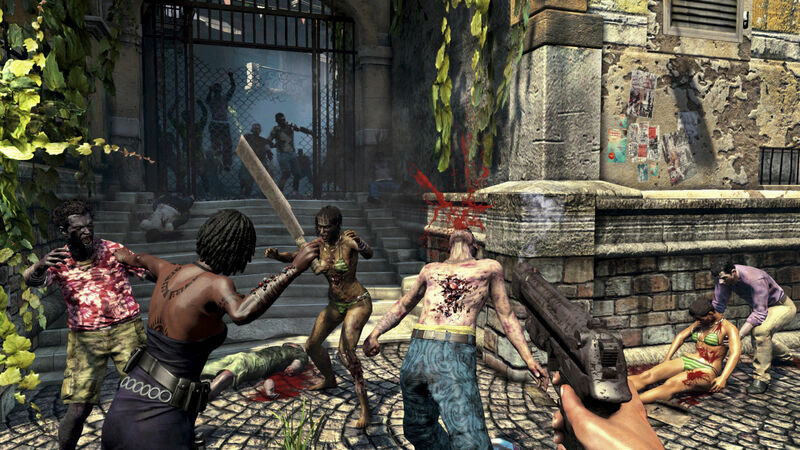 The first Dead Island was largely rooted in the survival horror genre, with resource collection and management used as a core component of your play. Weapons degraded over time, requiring players to find new ones and maintain old ones. Mods improved both durability and damage capabilities. New weapons could be scavenged, but money was required as well, both to keep them from falling apart and to upgrade them. Riptide brings back those basic ideas, with one notable and very significant difference: you never actually want for resources. The regular course of play sets you up with all of the equipment, crafting items, and money that you could ask for. Weapon maintenance is still a requirement, but it’s more about upkeep than resource management. Make no mistake: this is a good thing. The seemingly small change has a dramatic impact on the way Dead Island: Riptide plays in comparison to its predecessor. Action, rather than survival, is the focus. It doesn’t matter if you import a high-level character from the first game (completion not required) or start fresh with a new one (at level 15): you’re not going to want for effective zombie-smacking tools. The loot system feels more like a Borderlands or a Diablo situation now, where you’re invested in your gear collection and constantly looking for better loot drops. Other new systems create a deeper experience. A new set of sidequests allows for survivors at the home base hub to upgrade their shops and their own skills, the latter of which makes them more effective as fighters during the game’s new siege defense missions. Motorboats join trucks as driveable vehicles, and they’re a necessity in the swampy Palanoi jungles. The variety of weapons and upgrades in general has been upped considerably. There are new boss zombies to use them on as well, such as the hardy Wrestler and the ever-annoying, stun-inducing Screamer. Not everything is improved though. Getting around in the world can still be a headache when you suddenly find yourself far away from one of the few fast travel locations with no nearby vehicles to commandeer. Quest paths are often unclear as well thanks to an on-screen radar that features no minimap and a GPS indicator that only activates when you’re within 50m of your target. As the first sequel in a relatively new series, Dead Island: Riptide offers an odd mix of big improvements and “more of the same” shortfalls. Then there are the bugs. In solo games, you’ll see technical issues manifest most on the AI side, with enemies and friendlies alike clipping into the scenery or getting lost as they try to navigate around a small boulder. The aforementioned siege missions can be a particular pain when you realize that computer-controlled characters won’t save others from grappling zombies. These are drop everything moments for the player, since grappling zombies drain survivor health at a steady rate and a dead survivor results in a game over screen and mission restart. Co-op sessions fare even worse, with unpredictable respawns that will occasionally revive downed players clear across the map from wherever they just were. Another very obvious bug sees strings of pop-ups from completed quests appearing on the screen – for minutes at a time on occasion – when you jump into a co-op session with someone who is at an earlier point in the story. That also says nothing of the half-baked concepts at work in co-op. If a player joins with someone who is at a later point in the story, only character and inventory progression will be saved – not quest progress. Sure, it makes sense on some level, but it also effectively diminishes the value of playing in co-op when certain players are left with nothing to invest in. Especially since so many of Riptide‘s quests are designed for multiple players, to the point that some of the “carry these items here” tasks are straight-up tedious in solo games. Loot-sharing is also a mess. All money pickups are shared, as are locked chests (with scaling loot for each character), but everything else is picked up on a first-come, first-served basis. This includes random weapon drops and crafting items scattered throughout the world. There is nothing cooperative at all about having someone – friend or stranger – jump into your game and stealing all of the good stuff because s/he gets there first. Many rare item locations are static and loot respawns regularly, but Techland’s approach to the sharing of loot feels a bit too restrictive. As the first sequel in a relatively new series, Dead Island: Riptide offers an odd mix of big improvements and “more of the same” shortfalls. Techland seems to have settled into the right tone for its open-world zombie adventures, but some lingering issues from the previous game are joined by a host of new ones. Progress has been made and there is more fun to be had now than there was before, but the original Dead Island‘s “rough-edged gem” status makes it harder to forgive Riptide of committing similar sins.